Earlier this week, ESPN SweetSpot writer David Schoenfield declared fully recovered White Sox pitcher Jake Peavy the game’s best hurler. Peavy’s comeback, from two-time ERA champ to desperately dangling limb and now back to a batter-baffling force, has been remarkable and was never a given. But as good as Peavy’s been, overwhelming hitters with his four-pitch repertoire, he isn’t a guy who haunts the nightmares of his opponents. Stephen Strasburg, well, he’s another story. Thursday night, Strasburg won his third game of the season, striking out 13 Pirates in six innings of work with a biting fastball running to 97 miles per hour, a changeup that danced around 90, and a diving, heavy sinker that appeared to be made of that stuff they used to make Thor’s hammer. Granted, the Pirates are still the Pirates. 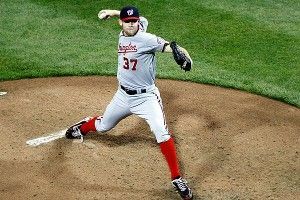 (Strasburg struck out 14 of ’em in his first-ever MLB start in June 2010.) This one lowered Strasburg’s ERA to 1.64, pushed him to the top of the strikeouts leader board and left him at 2.1 WAR for the season. That’s third-best in all of baseball the National League, behind Michael Bourn (who won’t keep this pace) and Reds pitcher Johnny Cueto (who might). In 2010, during Strasburg’s ballyhooed introduction, he confounded hitters and umpires, too. But his momentum was felled sadly and swiftly by an August 2010 Tommy John surgery. Since then, the Nationals have played things very safe with Stras. Thursday was just the third time in his major league career he tossed more than 100 pitches. In 24 career starts, he’s never made it into the eighth inning. And until he learns to more efficiently manage his pitch counts, always a challenge for a bat misser, he’ll struggle to go deep into games. What Strasburg needs next is to grow. Seize the opportunity against a limp offense to toss his first complete-game shutout. Dazzle us with an afternoon stunner. Challenge Kerry Wood’s 20 Ks. Hell, shut down an offense full stop, 27 in a row. So it was written, let it be told. Every day should be Strasmas.